Irritable bowel syndrome(IBS) is a general medical term for a very broad range of symptoms that can differ widely from person to person. Often when people go to the doctor complaining of a range of digestive problems a doctor will diagnose IBS. It is relatively common to hear people talking of having chronic digestive problems that they just can't seem to shake. The symptoms of IBS have usually hung around for a relatively long time and include bouts of stomach cramps, bloating, diarrhoea and/or constipation and weight gain or loss. It can feel like a general sluggishness of the digestive system with very uncomfortable and sometimes painful results. Often symptoms like stomach cramps are attributed to spasms of the intestines and one can be prescribed anti-spasmodics and enemas. When confronted with a patient suffering from IBS, doctors often reach for a pill. The problem is that these pills may generate negative side effects and only treat the symptoms of the problem and not the cause. 'Alosetron hydrochloride' and 'Tegaserod maleate' are two of the most commonly prescribed medicines for IBS and both can have side effects including decreased blood flow to the colon, which may lead to even more digestive problems and diseases. IBS can be caused by an array of different things including bad diet, too much alcohol, a stressful lifestyle, or too many courses of antibiotics, all of which can upset the natural balance of flora in the gut. Certain bacterias and yeasts may be over-growing and reacting with starches and sugars in foods causing fermentation which is felt as bloating that can be extremely uncomfortable and distressing. The trick is to reset the balance. Basically you want to reboot your system! Often people with these symptoms complain of other general health problems at the same time. eg. Headaches, Migrane. Silver is a antimicrobal element, in fact, in days gone by the rich would eat and drink from silverware due to its germicidal properties. Colloidal Silver is simply microscopic particles of pure silver suspended in a carrier liquid such as distilled water. Colloidal silver helps eliminate bad intestinal bacteria as well as any pathogens which have invaded the territory. In saying that, care must be taken as it will kill a large array of pathogens and does not distinguish between good and bad bacteria, so following the treatment, firstly with a course of digestive enzymes and then a good quality probiotic to replace all the good bacteria that has affected is key. 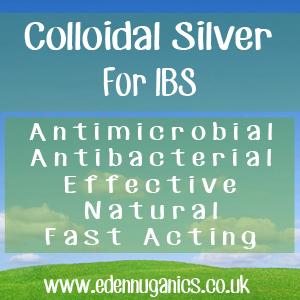 (Colloidal silver can also be used as an enema when suffering from IBS). Colloidal silver is quickly absorbed when taken in small maintenance doses so it does not get a chance to effectively reach the large intestine. In view of this a different approach is therefore necessary to treat the intestines. Irritable Bowel, diverticulitis, food poisoning and flu, conditions leading to diarrhoea where the offending pathogen is in the gut, should be treated with less frequent doses but at a much larger dose. As everyone varies hugely in their size, metabolism etc. it is very difficult to give a specific dosage but it is best to hit the problem hard so don't be afraid to take as much as is needed. There are no known negative side effects to taking large single doses of colloidal silver for a temporary period*. It's more a case of what works for you. Some recommend half a glass-full for a couple of days and others recommend more than this around 45cl (around two full tumblers full). At the same time it is useful to try and get some colloidal silver into the bloodstream by spraying sub-lingually (under the tongue) 4-5 times per day. Spray under the tongue and then hold it there for a few minutes before swallowing. This is a direct entry into the bloodstream but it is limited in how much can be absorbed. Digestive enzymes - If you are middle aged or older, it might be a good idea to consider taking supplemental digestive enzymes. Ageing tends to reduce the amount of digestive enzymes in our stomach and simply taking additional enzymes in supplement form can help the body break down foods into compounds. This also helps to make nutrients easier to digest, and can work to decrease the number of colonised micro-organisms in the stomach. Eating more fibre - This may seem obvious but a surprisingly large percentage of the population do not get enough fibre in their diets. Fibre helps to draw moisture from the intestines and avoid the loose stools often associated with IBS. Some of the best dietary sources of fibre include: Chia seeds, flaxseed, oatmeal, avocado and broccoli. Research into the role of fibre supplements in treating IBS symptoms is conflicting, with some finding no benefit, a few finding that adding fibre to the diet causes bloating and gas and yet more reporting that soluble fibre helps IBS sufferers by reducing constipation and diarrhoea. The reason everyone reacts differently to increased fibre intake is because there can be many differing causes of IBS. Each patient is unique. Probiotics - Probiotics are living micro-organisms that can help to supplement the gut's natural good bacteria, this in turn helps to balance intestinal flora and relieve symptoms of IBS. In particular, probiotics with a large amount of 'Bifidobacterium infantis' can help to alleviate IBS symptoms including abdominal pain, bloating, and bowel movement irregularity.